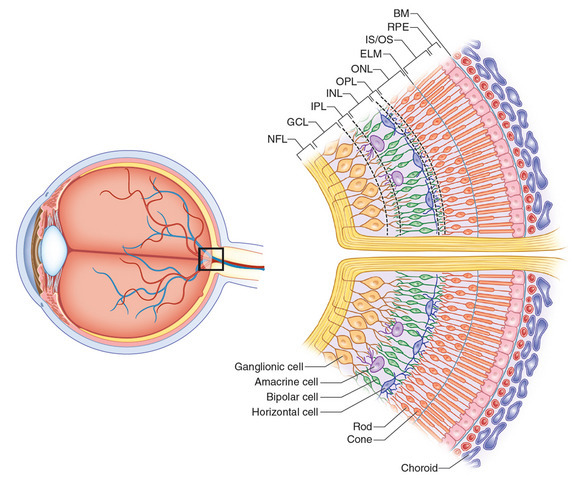 This page describes normal retinal anatomy. Refer to this page for comparison with the retinal disease pages. 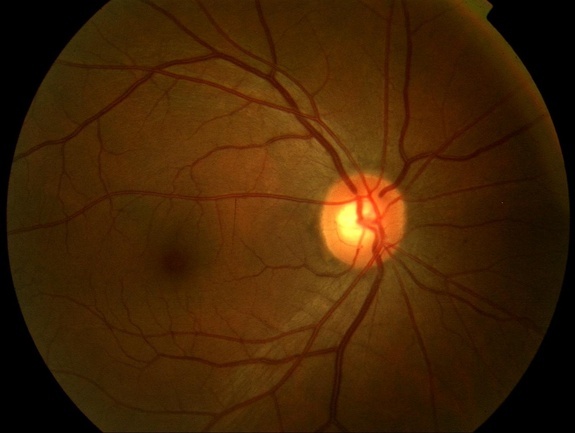 This fundus photograph shows the normal appearance of the retina. The whitish circle is the nerve that connects the retina to the brain. 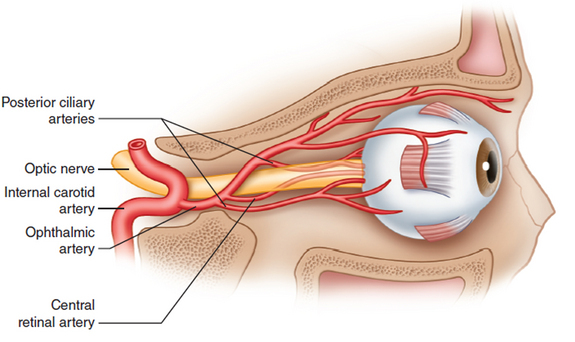 The red curving structures are blood vessels which enter the retina through the nerve. 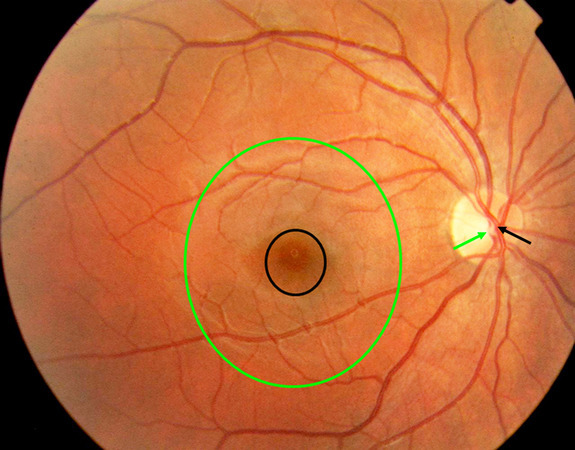 The following is a fundus photograph from a normal eye showing the macula (green circle) and fovea (black circle). The macula is a circular area of diameter 5.5 mm with a center located 17 degrees, or 4.0-5.0 mm, temporal, and 0.53 - 0.8mm inferior to the center of the optic disc. The normal central retinal artery (black arrow) is located nasal to the central retinal vein (green arrow) in the optic disc. The normal ratio of diameter of a retinal vein to a retinal artery at a given distance from the center of the optic disc is approximately 1.3:1. In a fluorescein angiogram, approximately two tablespoons of a dye (not related to iodine containing x-ray dyes) is injected into a vein in the patient's arm. As this dye circulates through the eye, many sequential black and white photographs are taken. These allow the ophthalmologist to analyze the blood supply to the retina. In this photo, the dye appears white as it fills the vessels. The center of the retina, called the macula, has no vessels, and is called the avascular zone. 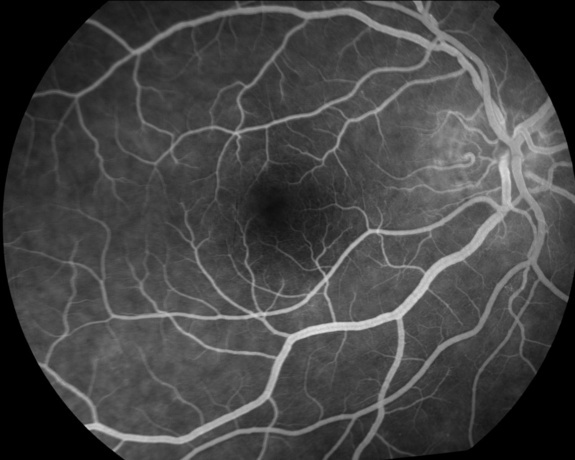 This is a frame from the midphase of a fluorescein angiogram of the inferotemporal quadrant of the retina of a normal eye. The yellow arrows indicate arteriovenous crossings in which the artery lies in front of the vein. The turquoise arrow indicates an arteriovenous crossing in which the vein lies in front of the artery. Approximately 70% of arteriovenous crossings are normally of the type artery in front of vein. 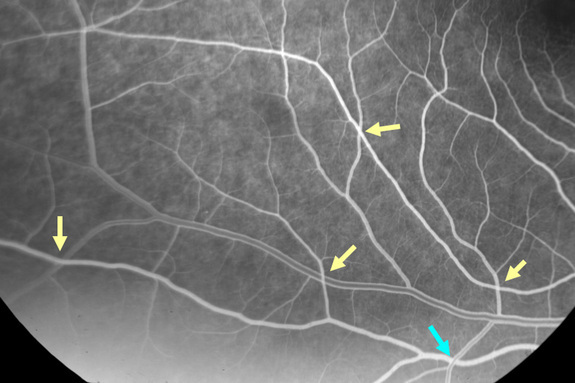 In contrast, 98 -100% of arteriovenous crossings associated with branch retinal vein occlusions are of the type artery in front of vein whence the inference that it is the relative compression of the underlying vein by the overlying sclerotic artery that predisposes to this condition. 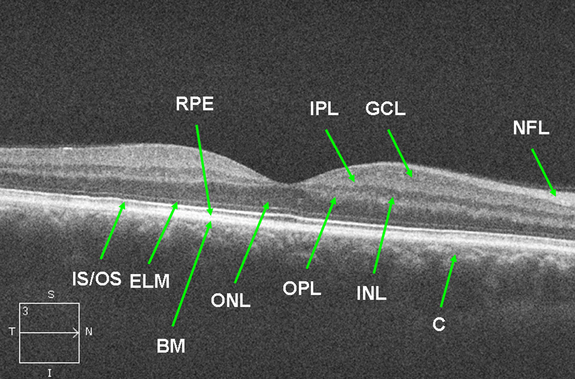 This is a spectral domain OCT image from a normal right eye depicting the layers of the retina. The vitreous is the black empty space at the top above the retina. 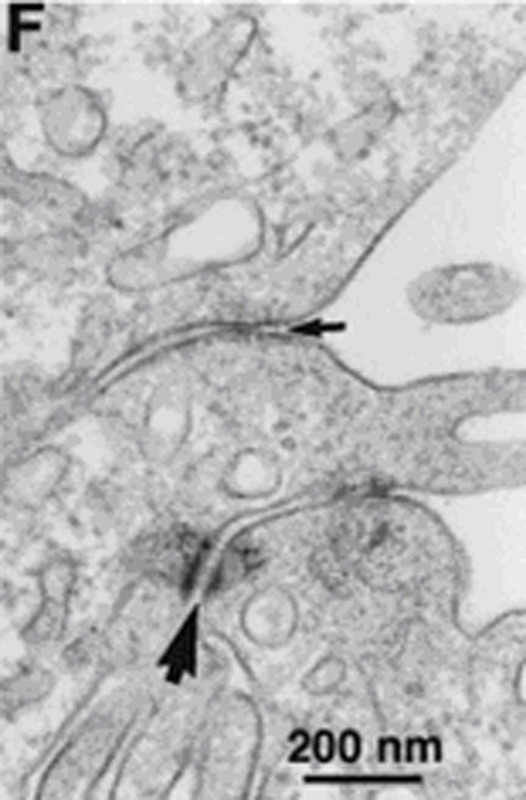 The foveal depression is seen in the center. The cones are taller than the rods producing greater separation between the inner segment/ outer segment junction and the apical retinal pigment epithelium at the fovea. NFL=nerve fiber layer. GCL=ganglion cell layer. IPL=inner plexiform layer. INL=inner nuclear layer. OPL=outer plexiform layer. ONL=outer nuclear layer. ELM=external limiting membrane. IS/OS=inner segment/ outer segment junction. RPE=retinal pigment epithelium. BM=Bruch's membrane. C=choroid. N=nasal. T=temporal. S=superior. I=inferior. The following illustrates the arterial supply of the right eye and orbit as viewed from the temporal side of the skull. The ophthalmic artery enters the orbit on the inferolateral side of the optic nerve and gives off the central retinal artery and posterior ciliary arteries near the orbital apex. Redrawn from Singh S, Dass R. The central artery of the retina I. Origin and course. Br J Ophthalmol. 1960; 44: 193-212. Proceeding from the vitreous to the choroid are the internal limiting membrane (ILM), nerve fiber layer (NFL), ganglion cell layer (GCL), inner plexiform layer (IPL), inner nuclear layer (INL), outer plexiform layer (OPL), outer nuclear layer (ONL), external limiting membrane (ELM), rod and cone inner and outer segments (IS/OS), and retinal pigment epithelium (RPE). The retina is thicker around the disc, where it measures 0.56 mm, and tapers to 0.18 mm at the equator and 0.11 mm at the ora as the density of all neural elements decreases peripherally. The topography of the macula includes a central thinner zone, the foveal depression, and a thicker paracentral annulus around the fovea where the ganglion cell layer, inner nuclear layer, and outer plexiform layer of Henle are thickest. Among its distinguishing features are the high density of cones, ≥ 2 layers of ganglion cells, and xanthophyll pigment within bipolar and ganglion cells. The central 1.5 mm circular area of the macula is the fovea, denoted by a gently curved depression in the retinal surface. Within the fovea is a roughly circular avascular area, the foveal avascular zone, approximately 400-500 µ in diameter which contains only cones, present at a density of approximately 140,000/mm2. The zonula occludens, or tight junction, is composed of proteins that span the cell membrane with the intracellular end anchored to the actin proteins of the internal cellular cytoskeleton and the external ends apposed to the analogous protein embedded in the neighbor cell's membrane. These junctions restrict the diffusion of small particles between cells and compose the blood-retina barrier in their role in retinal endothelial cells and the blood-ocular barrier in their role in retinal pigment epithelium and ciliary body epithelium. The intercellular space at a zonula occludens is 2.5 to 5 nm wide. The macula adherens junction, or desmosome, is a structural junction that resists shearing forces between cells. It has little role as a diffusion barrier as the space (approximately 20 to 30 nm) is wide compared to the width at a zonula occludens.